Hello again, this is my second go at this blogging thing; I hope everyone liked my little piece on Loot Crate. 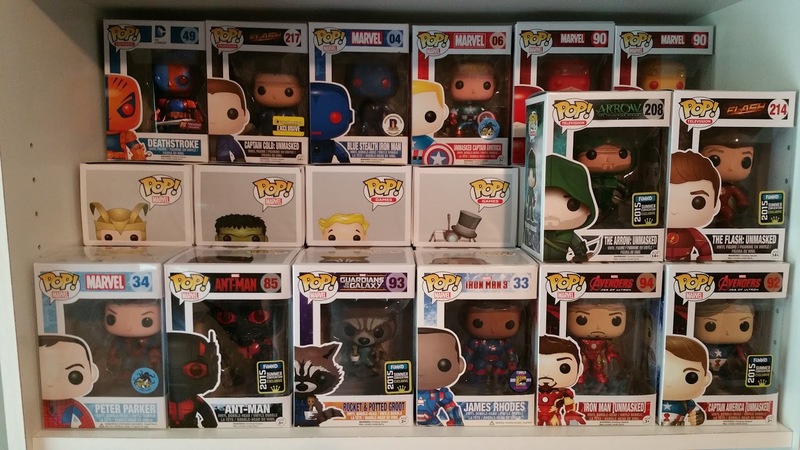 With that being said I am here to introduce you into the world of FUNKO Pop! Vinyls. I got my first Pop! from my Loot Crate subscription and I instantly became hooked. They hold over 150 licenses including Disney, Walking Dead, Marvel, DC Comics and so many more. 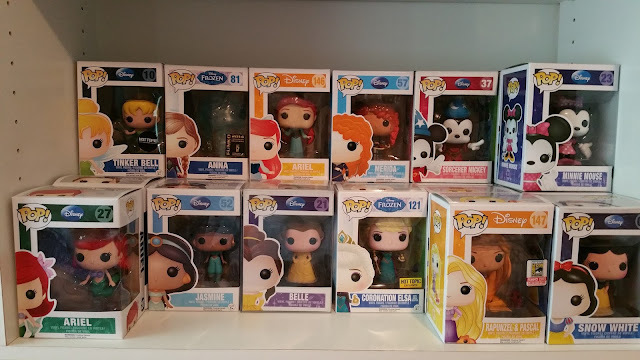 I collect Marvel and Star Wars with a separate collection of The Arrow and Flash because they are amazing, and even though my wife says she hates me for it, I think she secretly likes her Disney Princess collection more than she likes to admit. They come in all different shapes and sizes, the standard size POP! 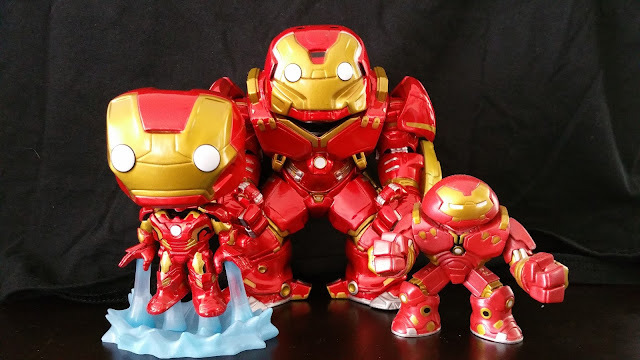 Is 4” and they get as big as 6” but they also make minis which normally stand 2” on average. They are considered toys by most common folk, but if you ask any POP! Collector, they are very much collectables. When it comes to collecting, it is all about the exclusive stickers. 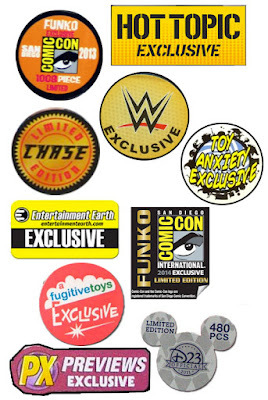 All of the different types of exclusive stickers can be found on www.hollywoodgonegeek.com. 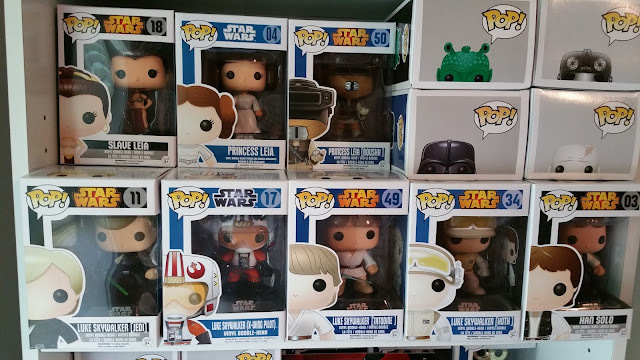 I have gotten most of my collection through trades on various Facebook groups, and websites such as Gemini Collectibles and Fugitive Toys. Local stores that sell them are Hot Topic and FYE. Every year the state of San Diego holds the Comic Cons of all Comic Cons. During this 3 day event men, women, and small children flock to see the celebrity Q&A panels, all the amazing cos-play costumes, and to purchase all the exclusive SDCC POPS! It gets so crazy at the FUNKO booth that you have to fill out a checklist of the ones you want to purchase, and they have to hand them to you as you stand in a line that they cut off after a certain amount of people for the entire day. I desperately want to go one day. My collection has grown significantly since last October and it keeps growing, my only advice to whoever is starting a collection or who wants to start one is to collect for you and what you like, do not collect to just collect because it will get overwhelming very fast. Most people like to keep them in the box, like myself and my wife, and some take them out of the box, like my daughter. We have a pretty good collection going on. We love finding Funko Pops while we're out shopping and we want to start, or add to someone's collection! 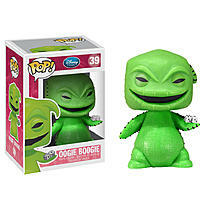 One lucky winner will get this Oogie Boogie figure! US winners only. Box has some wear. 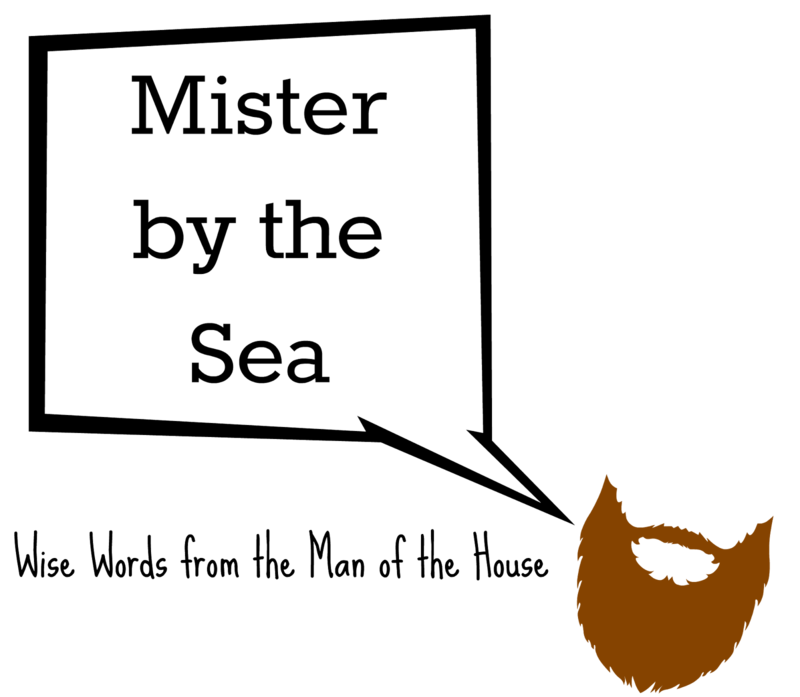 In the event that the prize can not be fulfilled, another of equal value may be substituted. Woo! what a whirlwind three days. 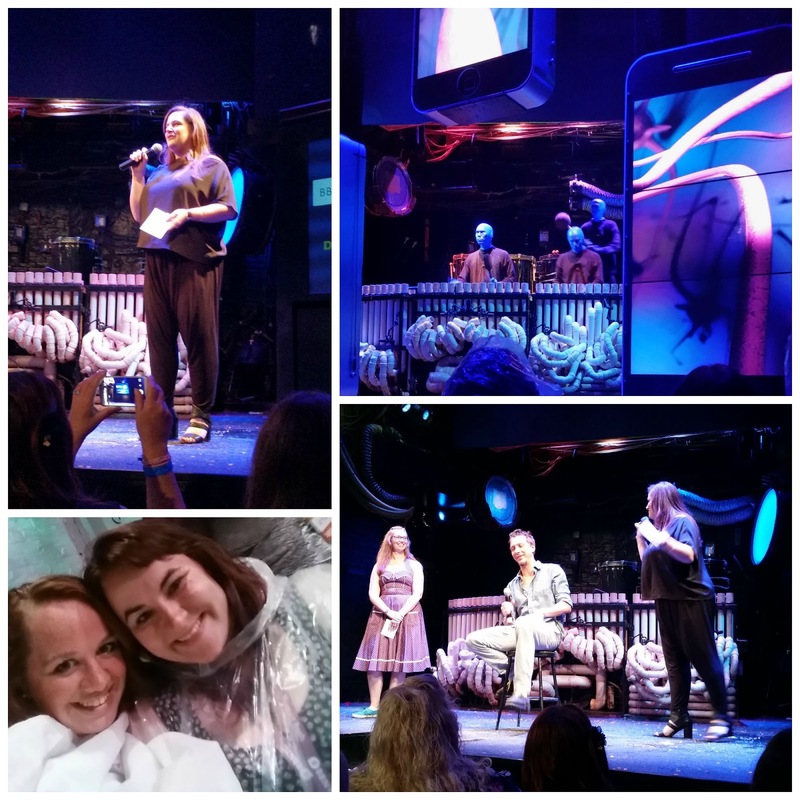 For the second year in a row, I headed off to New York City to go to Blogger Bash. Last year, Dave and the kids came with me, I was still nursing/pumping every few hours, and I was overwhelmed since it was my first *big* conference. This year, Dave stayed home to work, the amazing aunts from Conneticut came to watch the kids, and I shacked up at the Yotel with Sarah from sweet lil you and Brianna from Mending the Piggy Bank. Sarah is from Rhode Island and has a little girl just a year younger than Emmalee and Brianna has two boys and lives in Pennsylvania. I met them last year at Blogger Bash and we've been internet friends since. It was so nice to see them again and spend some in real life friend time together! The trip started off on a sad note when my FitBit got lost somewhere between my 7th and 27th bus stop and 10th and 42nd hotel room-- yes, I walked-- so I was nervous for the whole week but after a couple amazing calls to customer service, with a new FitBit on the way to my house, I was feeling much better! Wednesday night kicked off our festivities with the Getting Gorgeous event hosted by Audrey and Vera. Seriously, those two women are gorgeous, strong business women. The event was amazing. From a photo booth to popcorn, to free bras from Bali and professional make up applications coupled with Not Your Father's Root Beer and a gorgeous Troll Bead leather bracelet, those ladies know how to throw a party! Wednesday night we ventured into Times Square. Sarah has got to be the biggest fanatic I've ever met so the HUGE Disney Store in Times Square was a must see. I knew I wanted to grab Emma a souvenir there so it was a no-brainer. We walked to the M&M store, stopped into Carlo's Bakery so Brianna could grab a lobster tail, and had some pasta at a little cafe on 43rd st. After getting back to the room and putting on our pajamas, we realized it was the last night of FAO Schwartz so, me being me, threw on some clothes and headed off to 5th ave! Sadly, it was closed when we got there but a quick detour through Rockafeller Center was just as fun! Thursday was the kick off to Blogger Bash with a brunch hosted by Disney Infinity 3.0. We got a sneak peek at the amazingness of 3.0. 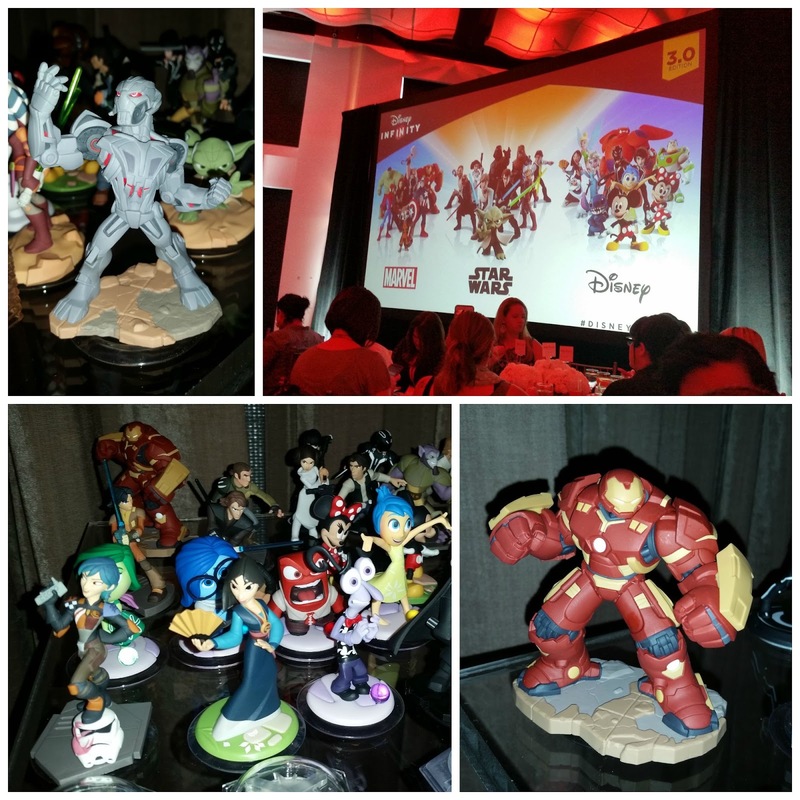 Disney Infinity will have Disney, Marvel, and Star Wars characters all in one game and the figures are forward compatible so there's no wasted investment in the pieces you already have! After brunch, we were shuttled off to a Private Blue Man Group performance! I love those Blue Men and David and I see them in Boston, but the Astor Theater was so much more intimate, and I was only 3 rows from the stage (! ), so it was a completely different experience. The Q and A session with Randall Jayce after the performance was amazing. You can tell the company is truly invested in their employees and the work they do! After the show, I should have been shuttled back to Pier 60 for our next event but I snuck off! Dave and I are loving collecting Funko Pop figures and Toy Tokyo, a company that carries exclusive ones is only a block away from the theater so after checking in and letting them know that I wasn't going to be lost, I ran off down the block. Sadly, they had nothing that I could afford wanted, because none of their exclusives were for sale for some reason. 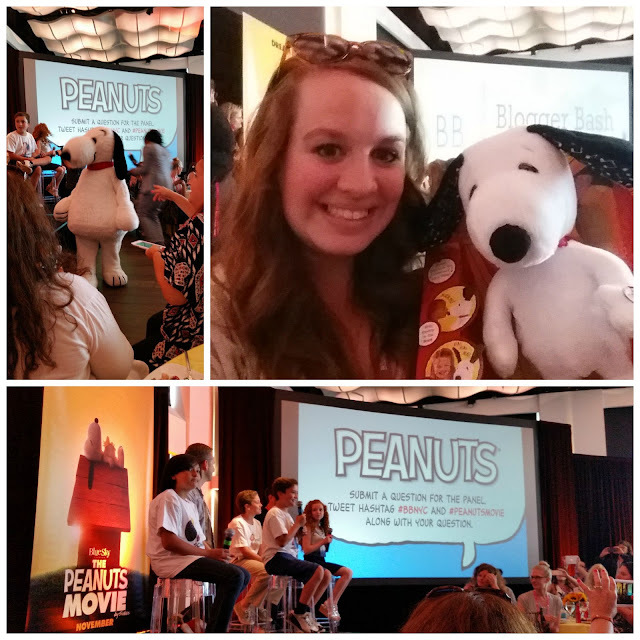 Friday started bright and early with a Peanuts Movie breakfast, complete with the voice actors of Linus, Schroeder, Pig Pen and the Little Red Haired Girl. The food was delicious (my favorite meal of the whole conference!) and the kids were adorable. The Peanuts Movie will be coming out this November and I can't wait to bring Emmalee! Another exciting part of breakfast was that I was the raffle winner for a dancing Snoopy doll! Emmalee loves the dancing dolls so Snoopy will fit right in with our collection! 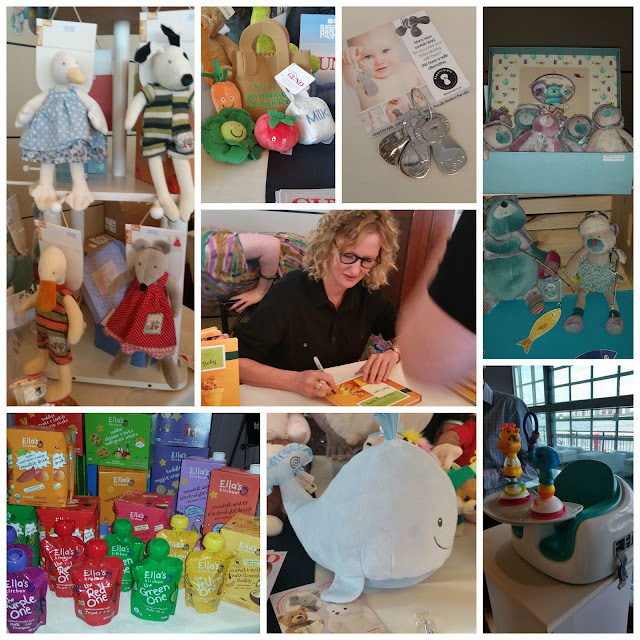 Up next was BabyPalooza with special guest Anne Geddes. 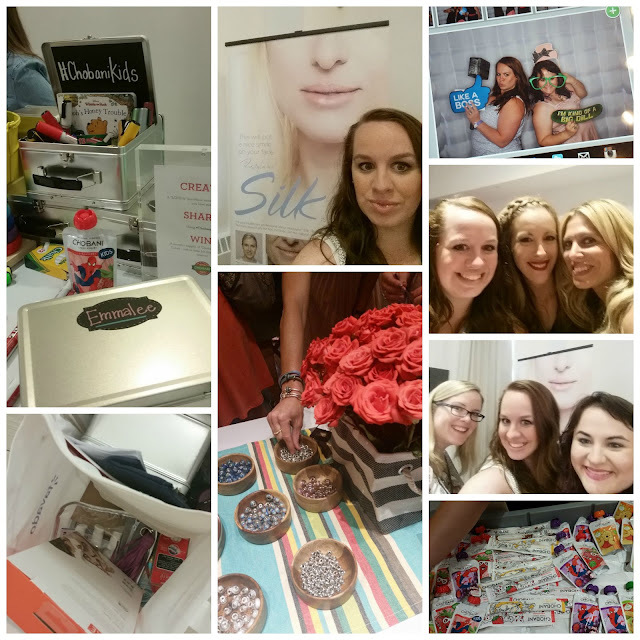 While she is amazing, she was at Blogger Bash last year so I found myself more interested in talking to the sponsors this year. Once again, I'm excited to be working a with a lot of the sponsors in the coming months so for now, you get just a peek! 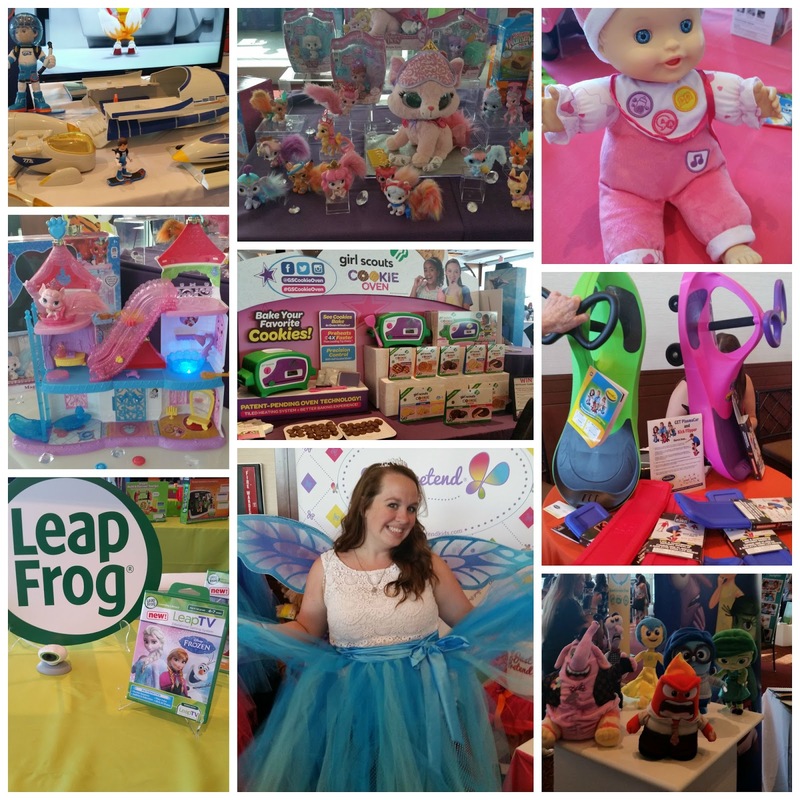 After BabyPalooza, I entertained myself in the Expo where I was able to meet with even more sponsors! Seriously, sponsors and companies out the wahzoo so get ready for some fun giveaways and reviews! One of my favorite parts of the Expo was the Rite Aid Recharge Lounge. Rite Aid offered complimentary massages, cucumber water, and a cnady bar! With views overlooking the Hudson, it was an amazing place to just sit and relax! I had SO much stuff at that point so I knew I wanted to head back to the hotel room to drop it all off. Then I started thinking, I'm only 2 blocks from Times Square, I should go see if there are any show tickets available for after Blogger Bash ends, so of course, I walked over. I made my way to TKTS under the stairs in Times Square hoping to see either Aladdin or Finding Neverland but there were no Aladdin tickets and the least expensive seats for Finding Neverland were out of my price range. One of the employees asked if I was able to get tickets to a show I wanted as I was leaving, I replied no so he asked what I had been hoping for. He told me to run to the New Amsterdam Theater because Aladdin does a lottery for 20 $30 tickets for each show two hours before the show starts. I entered but suddenly there were 70 other people also entering. Imagine my excitement when my name was picked! I was able to purchase 2 $130 seats for only $30 each! I hopped in an Uber and went back to Pier 60 to check out the closing carnival. Visually, it was stunning and the Canadian Lentils food was delicious, but the place had cleared out before 7 so I headed back uptown to meet up with Sarah so we could head to the show together. I've never ever seen a show on Broadway. I've seen off Broadway shows, but never on Broadway so I was giddy. I have a whole huge post coming in the next few days because it was just that amazing but you need to know, you have to see Aladdin on Broadway. Even if it's only to see the Genie whip and nae nae! During intermission we made friends with the usher and he told us where to go after the show so we could meet the cast! 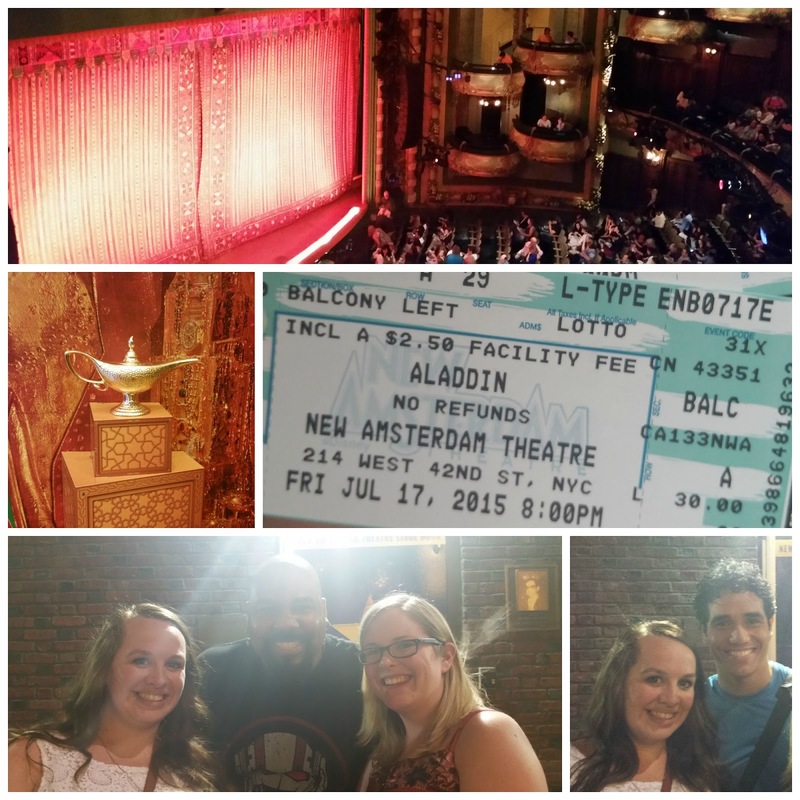 Sarah and I stayed long enough to meet the actors who played Aladdin, Jasmine, and the Genie! Ahh... I'm still over the moon about it! Some late night packing, an early am walk to the Hudson -- and a Dunkin Donuts-- and then it was back home. I miss the roommates already, I miss the amazing internet friends who became real friends, and I miss the room service, but I'm so excited to be home with my family and I'm already counting down to next year! I'm always on the lookout for a new place to take the kids to spend some time. 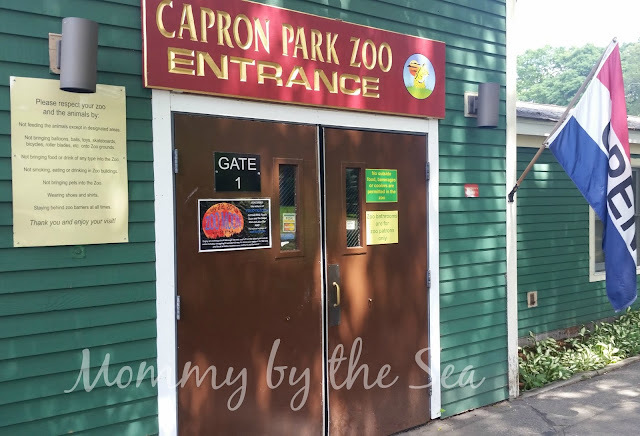 The library offered a pass for Capron Park Zoo in Attleboro, MA so I figured we could check it out! I finished up summer school one morning and put the kids in the car to go. It looks so regal is you pull in. I love the quintessential scrolled gate! it's just too perfect! The first thing you notice as you pull in is the huge playground just outside the zoo. Because it is outside of the zoo, you can go even if you don't head inside the zoo! There is also a covered pavilion so pack a blanket and a cooler and you can relax with lunch before or after heading in if you want, as no outside food is allowed in the zoo. The zoo is a small scale zoo. If your child is like mine and gets excited every time she sees another exhgibit and then runs off saying "Ooooh, I need to see whats in there! ", you can finish the zoo in about 40 minutes. They have some more interesting animals like kangaroos, emus, and lions, as well as a Nocturnal House! My daughter's favorites are the monkeys but I love the river otters! 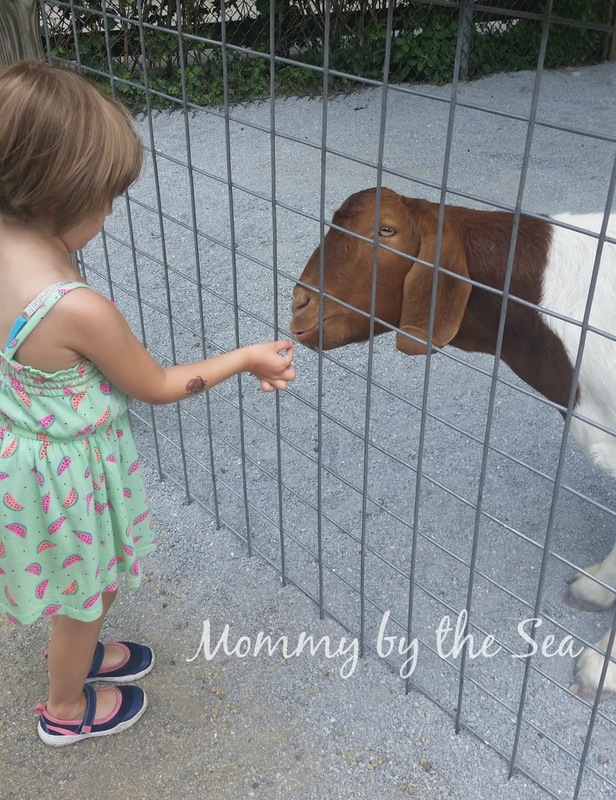 There's even a small area where you can feed goats and alpacas. I was nervous at first but there's an antibacterial hand washing station so she could clean up after! The Capron Park Zoo also features a little snack stand. It is cash only so make sure you bring some if you want to eat in the park instead of packing a picnic to eat at the playground. 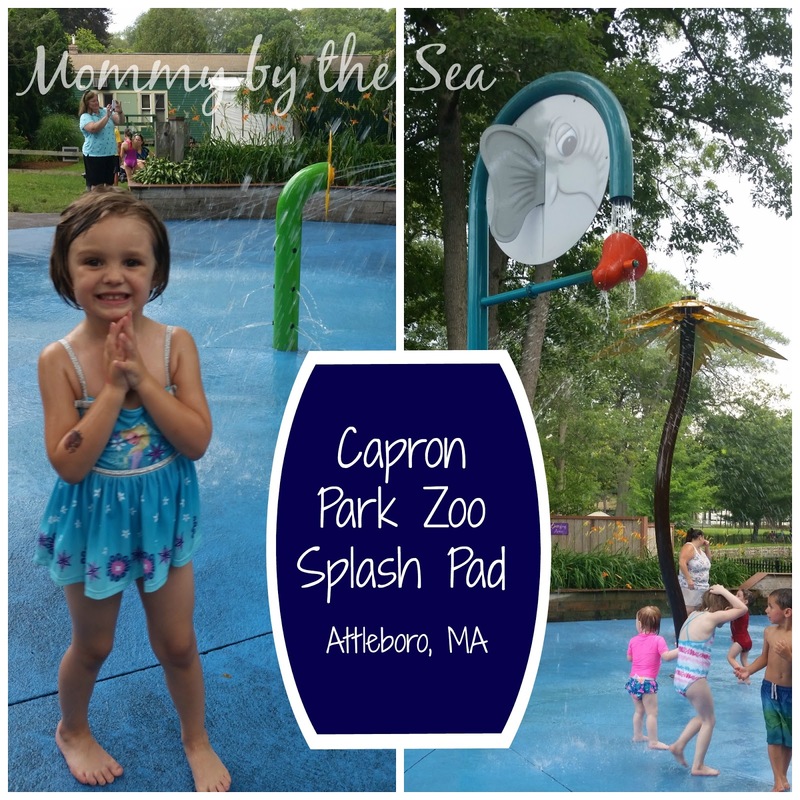 What I love about the Capron Park Zoo is that they also have a splash pad, and since it is part of the zoo, it's not nearly as overrun as our local splash pad. We spent another 25 minutes playing at the splash pad and only left because of some crazy downpours that came through suddenly! 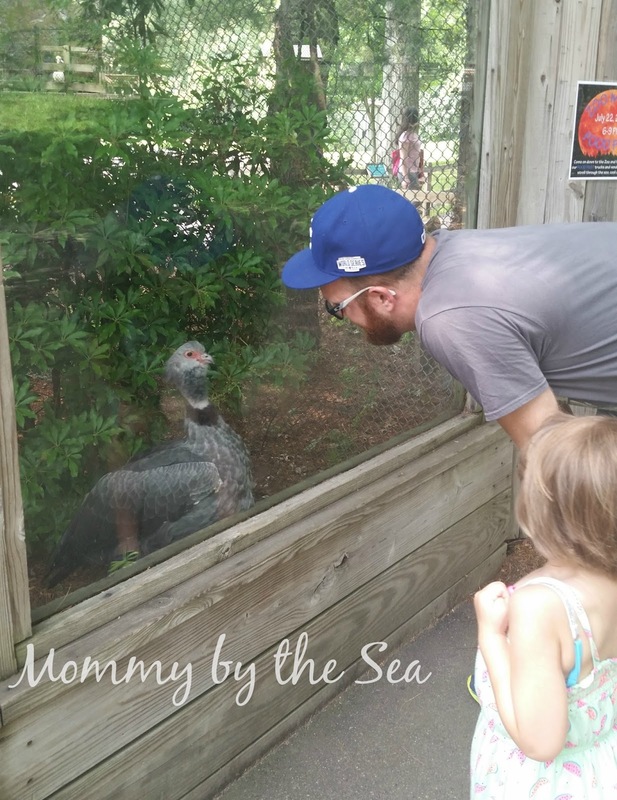 It's a great park because it has animals that excite the 4 year old, while still being small enough that she can walk through the whole thing without getting whiny or tired. Capron Park Zoo is located at 201 County St in Attleboro, MA 02703. It is open from 10-5 in the summer but last admission is at 4 pm. Last week was the first week of summer school and I kind of panicked! 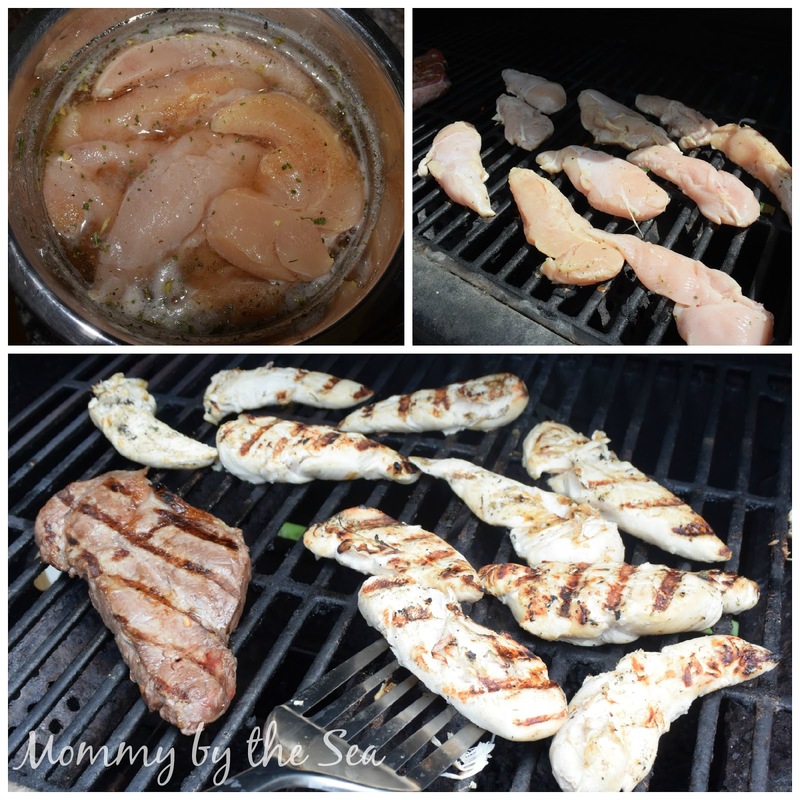 I can't believe we hadn't had our first summer barbeque yet! We spent the first week of summer in Disney and the week after we literally just sat around the house unpacking from our Disney vacation, so when summer school started, it was just the kick I needed to decide to have our first summer barbeque! We stopped at Price Chopper to pick up the staples: Certified Angus Beef, chicken tenderloins, slaw, and watermelon. As we were going to grab some Coca-Cola, we came across the coolers full of beer and inspiration struck! Dave has been loving Redd's Apple Ale so why not marinate the chicken in it! Yum! 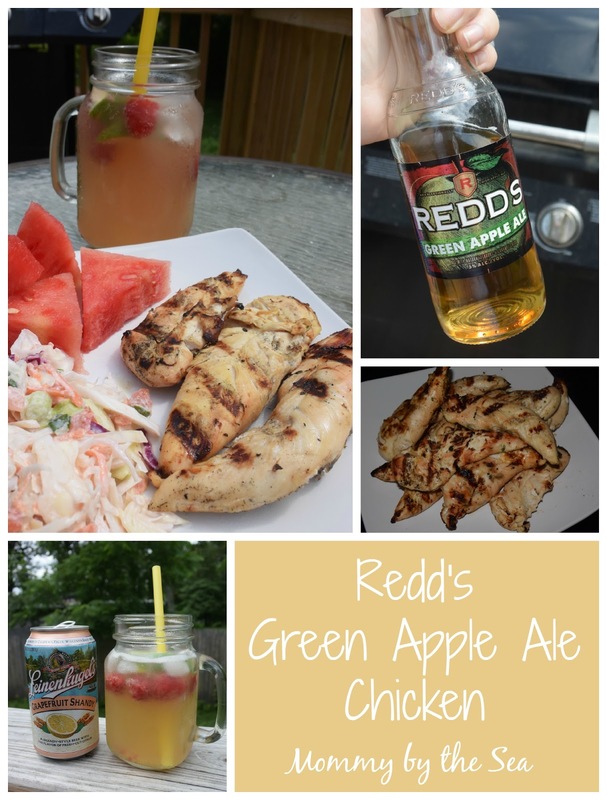 To make the marinade, I sprinkled the chicken tenderloins with a mixture of meat and poultry seasonings and then put it in a bowl full of Redd's Apple Ale. I let it marinate overnight to really get the flavor into the chicken. 1. Apply seasonings to chicken and place in a small bowl. 2. Cover the chicken with Green (or Red!) Apple Ale. 4. Heat grill to 450* and grill until cooked through. We paired the chicken with a delicious summer slaw made with shredded cabbage, carrots, and green apples. The apples in the slaw paired so well, and really brought out the flavor, of the marinated chicken. Everyone knows that the beverages at a barbeque are just as important as the food so we always load up. In addition to the Redd's Apple Ale, I got super excited when I saw a whole door full of Leigenkugal's Shandy! 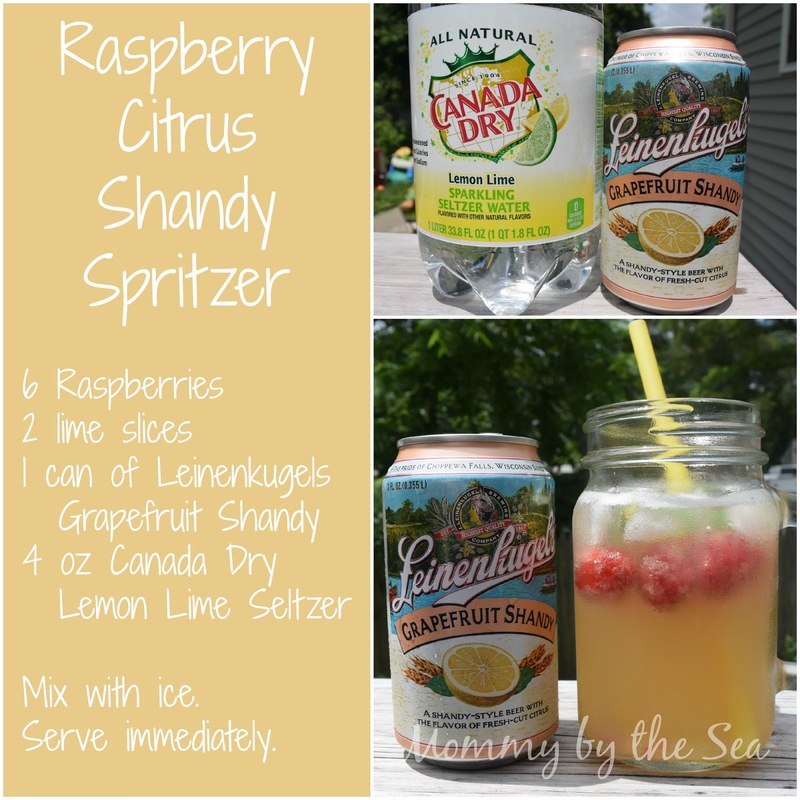 I love their Summer Shandy but was even more excited about a new Grapefruit Shandy! 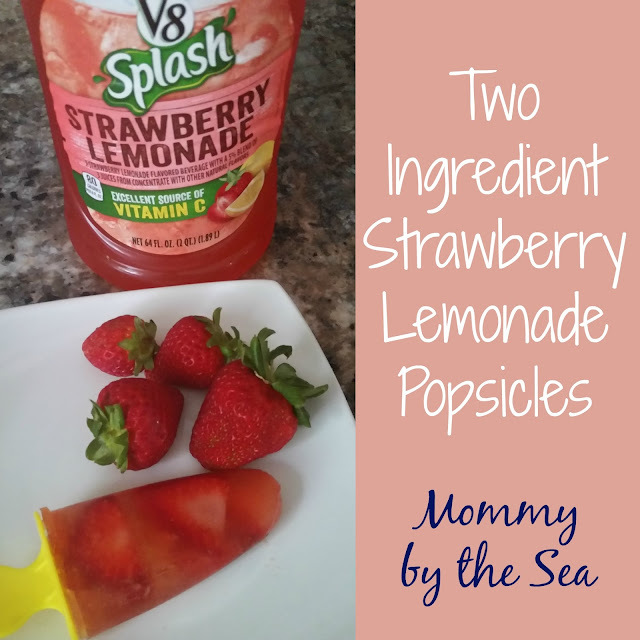 I love grapefruit and knew I could make a refreshing bubbly drink with it! I muddled the raspberries in the glass, added ice and filled the cup 3/4 of the way with the Grapefruit Shandy. I topped off the glass with some Canada Dry Seltzer water. It was the perfect "sitting on the back porch" summer drink. The whole meal was delicious! I'll be adding it to my Pinterest recipe arsenal asap so I can make it next summer too. 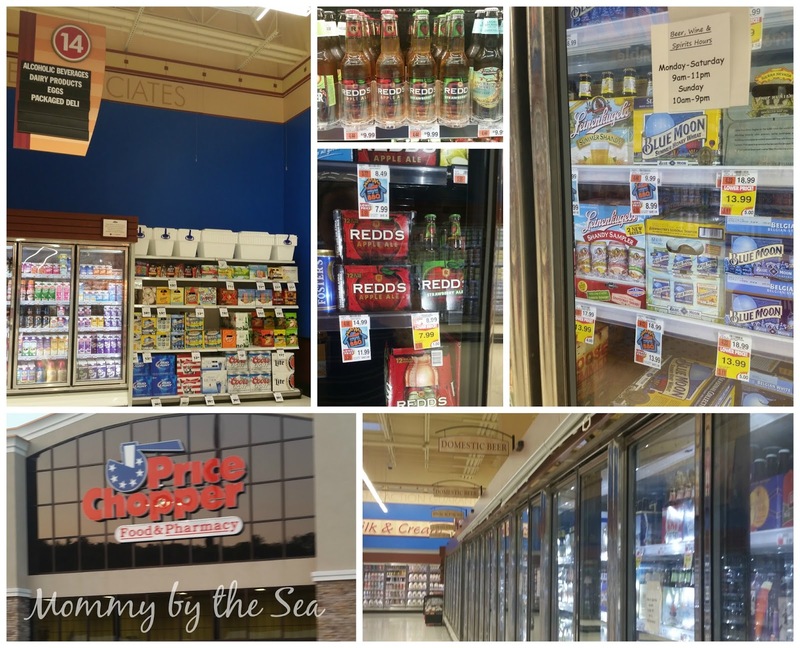 Price Chopper has an amazing BBQ Pinterest page; you have to check it out! There are so many great ideas there: you'll have to come back and let me know which one you'll be cooking next! Getting Redd's Green Apple Ale at Price Chopper was such a great experience and tastes so delicious that I love to continue the great drinks with my friends at The Town Crier, The Seaport Inn & Marina, or the Ice Chest in Fairhaven! I am loving dresses for this summer. They are effortless and can be worn every day for any occasion. Old Navy is doing amazing with their dress game and I could spend $1000 easily for this summer! Emma has been asking to make "pop-akles" for days so while I was at my local grocery store, I headed down the juice aisle to see what yummy fruit combination I could find. I LOVE V8 Splash juice. Love. Judge away. And strawberry lemonade and summer just go hand in hand. I knew I could sneak in some fresh strawberries to I threw both in the cart! We used this Popsicle mold from IKEA ($2! ), but if Ikea isn't nearby, you can grab it from Amazon for less than $7. And seriously, they are the easiest things ever! 1. Wash and cut the strawberries. I wanted big chunks but you can choose how much you chop them up. 2. Distribute the strawberries into your popsicle molds. 3. Fill molds with strawberry lemonade. 5. Freeze. Ours took about 4 hours. You may need to run them under water to loosen them up! What combination should I make next? Disclaimer: I was provided a stroller free of charge to facilitate this review. All thoughts and opinions are my own. The world knows I am obsessed with my stroller and I have read some horror stories about strollers getting destroyed during airplane transport. I just couldn't risk anything happening to "my baby". Even though I knew I'd have my LILLEbaby airflow carrier with me for the the little guy, I also knew that I would need a stroller for the princess. Lots of walking, some late nights, and big crowds where she could easily get lost... I needed to have a mode of transportation for her that did not require me carrying her while wearing her brother. 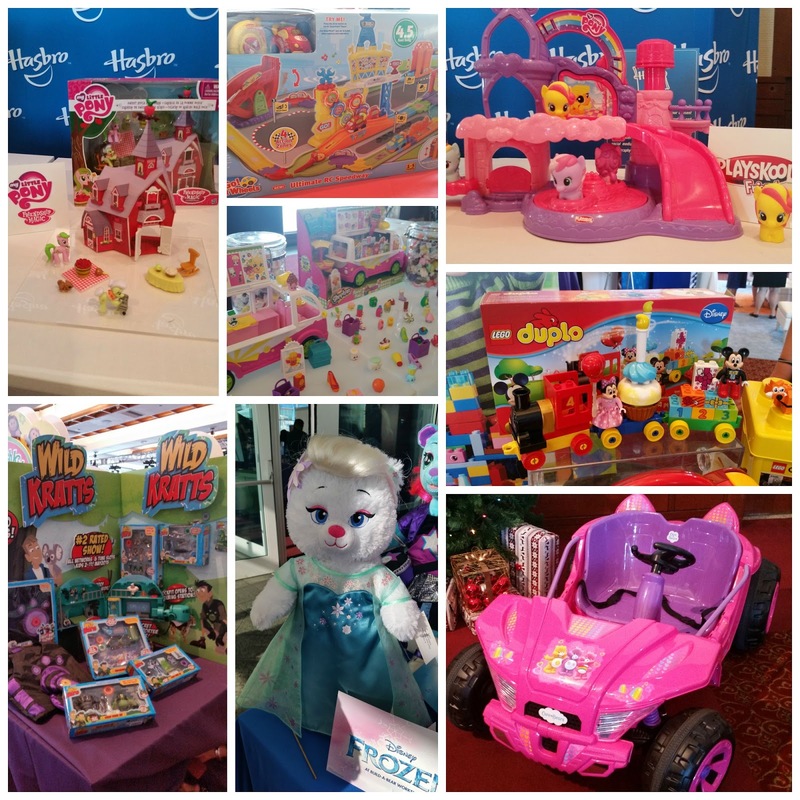 Strollers and Groceries partnered with Kingdom Strollers to provide strollers and groceries to Disney, as well as many other local places, vacationers. 1. One low delivery fee for both the stroller and the groceries! 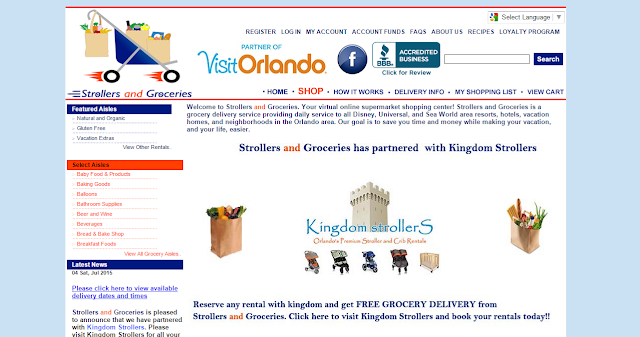 If you rent a stroller from Strollers and Groceries, they will deliver your groceries for free! That's a $14 savings! In addition to the double stroller we rented, we had milk, cereal, yogurt, and fresh produce delivered to the hotel room. It made a quick breakfast before the park a breeze! 2. It's so much more affordable than Disney stroller rentals. 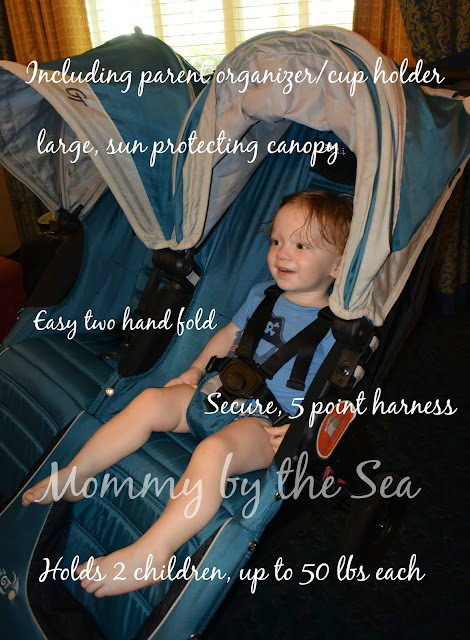 We rented the City Mini GT Double stroller for a total of $80 for an entire week. At $31 a day for a double stroller from Disney, we saved over a $100 off of the Disney price! 3. Much more comfortable than a Disney stroller! 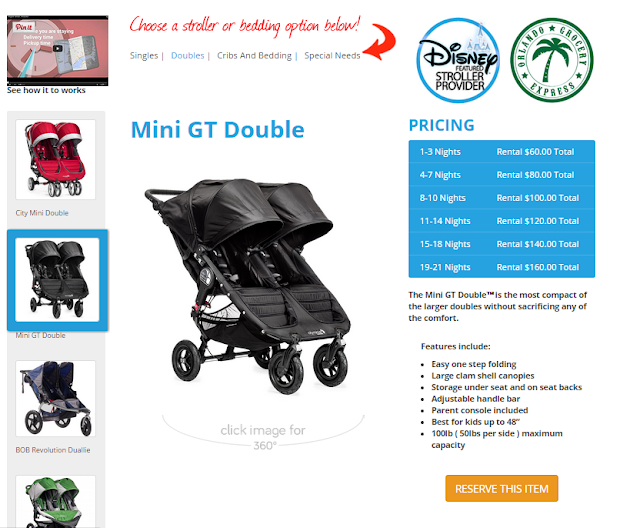 Now check out the strollers Disney offers. Hard plastic. No reclining options. It's clear to see which you would prefer. 4. You need a double, even if you only have one kid. 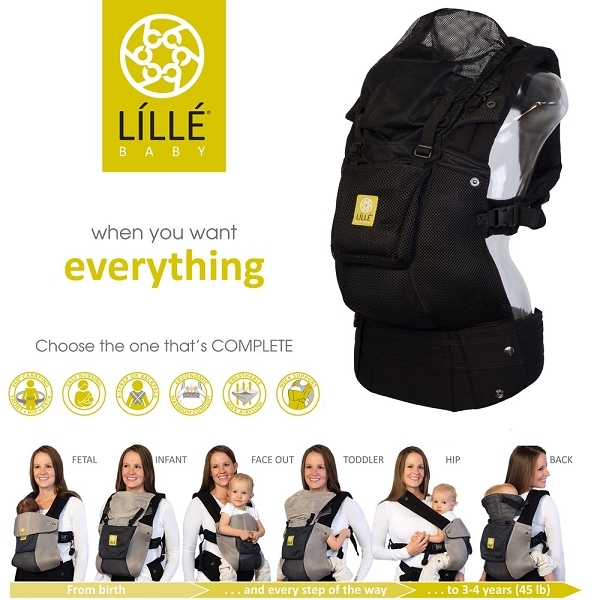 Half the time I was wearing Tyler in our LILLEbaby airflow carrier, but I still needed a place to put all the "stuff" we would need over the day: diapers, wipes, change of clothes, small snacks to hold the kids over, ponchos, etc. That's a lot to carry on my shoulder while also wearing a 20 lb little guy. 5. 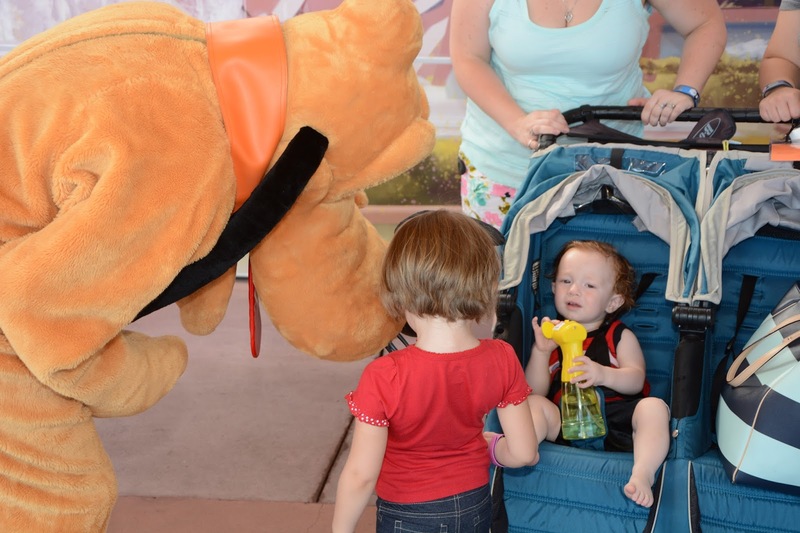 You can't remove Disney strollers from the parks. Which means if the above had happened in a Disney Park stroller, someone would have been carrying a sleeping child the whole way home. You do have to fold up the strollers on the buses but the ability to keep her in the stroller as we left the park and waited for the buses and being able to put her back in it from the resort bus stop to our room was priceless. We would not have survived our Disney vacation without this amazing stroller! 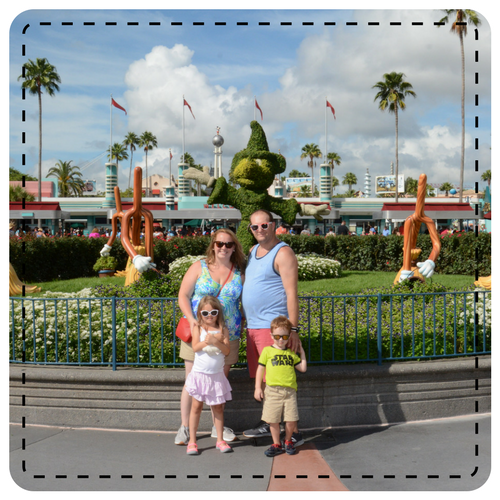 Whether it was a napping place for the little guy while I went on rides with the princess, a purse holder, or a way to get through the parks quickly without the 4 year old being distracted by everything, it was perfect for us!